What if Anarchists Got What They Asked For? End to democracy! End to capitalism! End to tyranny! What’s the solution? ANARCHY! Of course! I’ve always wondered, how would these anarchists react if their dreams came true? How would they cope in a civilization in anarchy? My guess is they’d be the first to go running back to their middle-class homes to cry to their mommies, but that’s just speculation. 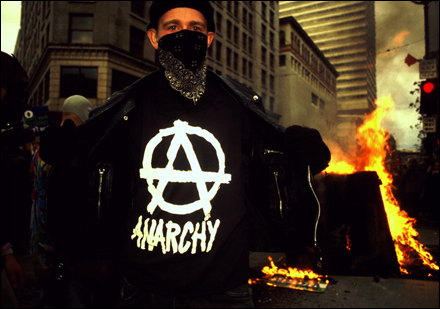 What is it about anarchy that is so appealing to them? Do they really understand what they are advocating? An excellent case study for anarchism in the modern world is Somalia from 1991 to 2006. This period provided a unique chance to witness the results of a state of anarchism on a society. The results were not good. The level of daily violence became “catastrophic,” according to Doctors Without Borders and “a statistic from 2000 indicated that only 21% of the population had access to safe drinking water at that time, and Somalia had one of the highest child mortality rates in the world with 10% of children dying at birth and 25% of those surviving birth dying before age five” (CIA World Fact Book). Adult literacy dropped to 24%, civil war erupted, and diseases like tuberculosis and measles ran rampant. I am not quite sure what it is about the above example that is so ideal or worthy of fighting for. Actually, I have a hard time believing that the anarchists you see at any protest are actually serious about bringing about a descent into anarchism. To be honest, they seem like young kids who just want to make unnecessary trouble and enjoy the verbal masturbation of talking pseudo-intellectually afterwards.